There’s no shortage of information out there about avoiding visa scams when crossing the border into Cambodia from Thailand. Head straight to the border, make a beeline to Thai Customs, do not be swayed by anyone who approaches you about getting a visa. But what if your unscrupulous tuktuk driver drops you off at a visa scam office and leaves you to their clutches? It all started as we stepped off the train in Aranyaprathet. I could see tuktuks waiting just outside the station, but a driver in an orange vest with a slightly downturned face and quiet voice approached us while we were still on the platform and asked where we wanted to go. Too easy. Mistake one: trusting the driver in the orange vest (T thinks those in orange were not very legit). Also: feeling sorry for him and deciding not to bargain down from 100 baht, the going rate. Eventually, a road sign bearing the word ‘border’ came into sight, and we turned left into that road, then hastily pulled into a parking lot behind a nondescript building with a ‘Welcome to Cambodia’ sign. Dodgy. Along with a few other people who’d arrived at the same time, we were ushered inside by a storm of men who’d descended upon us as we alighted. Two Asian girls ducked away down the front towards the road, and my instinct was to follow them – but I let us be swept along. Mistake number two. Inside, a ton of Western tourists were busy filling out forms. The same forms were placed in front of us – plain A4s printed with black ink, not looking particularly governmental. I tried pulling the “Mee visa lao!” schtick on the man who’d attached himself to us like a leech, but I don’t think I was particularly convincing. After a bit of muttering back and forth with T, I asked the man how much visas were. “1000 baht,” he replied. “No! US$20,” I said, outraged. And at that, we got up to leave. “You go check, see police, then come back” said the man. That worried me a bit. These guys were obviously shady; what would a visit to their ‘police’ entail? Nonetheless, my aversion to being ripped off won out. Once out on the hot, dusty road, T and I were both at a loss. We’re both beginner travellers, from New Zealand no less – we’re not used to land border crossings, what they look like, or how they operate. I knew we weren’t in the right place; I just didn’t know where we were supposed to be or how to get there. At that very moment, a man in a blue uniform came up from behind and told us to walk to the end of the road until we saw Thai customs. Someone offering genuine help! I could have kissed him. Sure enough, we headed down towards the end of the road, and before long we saw massive signs for ‘Departures’ to the left. There were a ton of Thais in the Thai exit line, but not many foreigners. Wild guess: most fell prey to visa scams. I did see one tuktuk carrying a Westerner down to the real border office – he was, however, disabled, so presumably the driver took pity on him. Lesson one: do not be afraid to get up and leave. Simply walk out. Lesson two: if you are unceremoniously dumped at a fake visa office, but you know you’re on the border road (i.e. you’ve seen the sign), then walk to the end. That’s it. From then on, simply fill out your departure card, proceed through Thai Customs, exit over the Friendship Bridge, through the Cambodian arch, and head right into the Cambodian office to get your visa on arrival. And try not to let it mar your experience – the whole thing soured T on Cambodia, despite the fact this all took place on the Thailand side. I never heard of fake visa offices in other countries. I guess I am fairly naive when it comes to that. What alerted you to it? If you do any reading at all about crossing the border you’ll see exactly what I mean. Basically, you shouldn’t be doing anything re: Cambodia visa till you actually exit Thailand and enter the Cambodian side. This fake visa office was still on the Thai side. Wow! I had no idea about any of this. Good to know for when/if we do this. They are just as shady in places like Portugal, especially small towns. I should do a post on it one day. China wasn’t a picnic either. It was filled with scammers. Ugh. I took a train through Bosnia about a decade ago and they stopped the entire train at the border in the middle of the night to collect our passports. US passports had a different visa price than what we had previously found listed online. But it was still only about $20, so we just paid it not wanting to get stranded at the bosnian border in the middle of the night. 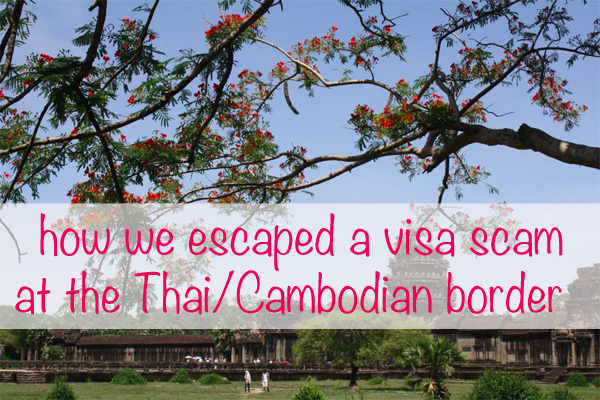 I read up lots about fake visa scams before I went off to backpack in SE Asia. Because I was looking at a six week timeframe for my travels and was living in Beijing where all the foreign embassies in China are located, I spent an afternoon Embassy hopping and getting all my visas in order before jetting off to the SE Asia region. Obviously not an option for everyone but I was glad to have the visas taken care of beforehand! That’s crazy! What do they want at the fake visa offices? Just more money? Interesting. The only land visa I’ve ever gotten is here, and it’s probably highly illegal to do anything remotely scam-like. Granted, it was still difficult to really figure out and if I hadn’t had my boyfriend-whose-lived-here-forever, I might have messed it up somehow. They also did not speak a lot of English, which was silly for a border. And it was sorely lacking in signs for where pedestrian border-crosses should happen. I would just wander towards my country of choice until someone stopped me and told me where I was supposed to be. Similar problem just the other day. A restaurant hostess over the phone insisted that she needed my credit card to hold the reservation, which is ludicrous (or is it? perhaps I just haven’t experienced this). I had a problem with a shady cab driver in China last summer, though it had nothing to do with a border crossing. I paid the driver $30 RMB (like $4 USD) for a trip that I later found out should have cost half. Not a big deal but when I gave him a $50 RMB bill, he took it and gave it back telling me that it was ripped. Initially I argued with him, but I was tired and our luggage was in the trunk so I relented and gave him a $100 RMB bill since I didn’t have anything smaller. It turned out that the he switched the $50 he returned to me for a counterfeit…as was the change that he gave me for the $100. I found out at the hotel and then restaurant when they refused to take my counterfeit bills. Wow. Never heard about those before. Good thing you figured out and left before it was too late.